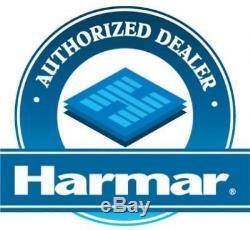 Harmar AL500 Universal Powered Wheelchair & Scooter Chair Lift - 2019 Model. Are you in need of an automotive device to lift and transport your wheelchair, scooter or similar device? Harmars AL500 Universal Power Chair Lift and/or scooter lift is a revolutionary unique design and is the ideal solution for safely and securely transporting todays largest powered chairs and scooters. 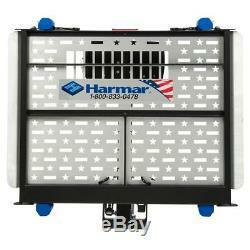 It features Harmar's Stars -N- Stripes aluminum deck design which is dedicated to our veterans and commemorates Harmar's heritage as a company based and working in the United States. The AL500 Universal Power Chair Lift is heavily reinforced and engineered to withstand the rigors of everyday transport. Plus, with its extra-large deck and optional adjustable cradles, this lift is by far the biggest and most capable outside lift on the market. The AL500 Universal Power Chair Lift has a 350 lb. Lift capacity and will accommodate most power chairs and scooters and like all Harmars vehicle lifts it is manufactured in the USA and arrives pre-assembled and ready to install. Harmars AL500 offers the convenience and versatility to carry a power chair or scooter with one lift. 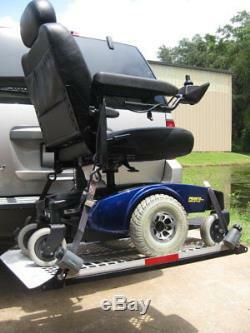 Also available: AL500HD Heavy-Duty Universal Power Chair Lift with a heavier 400 lb. Find it for less and well beat it! Carries larger power scooters or power chairs with no modifications required. Carries virtually all scooters AND power chairs. 4 - Self-tensioning, QStraint retractors/front and rear cradles. 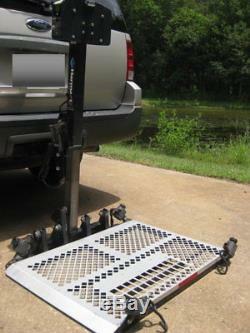 This easy to operate option allows an unoccupied outside lift to be easily pivoted away for clear access to the trunk, lift gate or tailgate. AL105 Swing Away - 350 lbs capacity, 38 lbs install weight. AL105L Light Weight Swing-Away-350 lbs capacity, 25 lbs install weight. 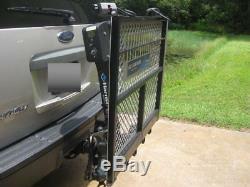 AL123: class III hitch adapter. AL107: hitch post; class II. Class II or III Hitch. Travel Scooters Full Sized Scooters Full-Size Power Wheelchairs. We are here to help you better understand your available options. We can assist you with questions about financing, installation, warranties, and understanding the differences between the models and options offered. We are also available to provide you with the installation of your device. Our customer service is available 24/7 and provides Emergency Service for just about ANY stair lift, vertical platform lift, or ramp that may need repair. Our staff is factory trained, certified and do not work on a commission basis so you can be assured your service calls and repairs are warranted. The item "Harmar AL500 Universal Powered Wheelchair & Scooter Chair Lift 2019 Model" is in sale since Friday, July 13, 2018. 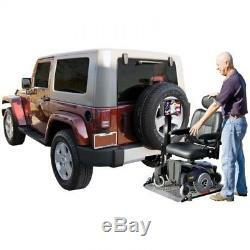 This item is in the category "Health & Beauty\Medical & Mobility\Mobility/Walking Equipment\Other Mobility Equipment". 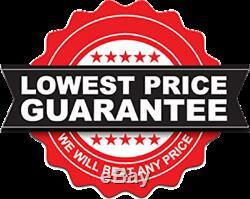 The seller is "jamesonsales" and is located in Henrico, Virginia. This item can be shipped to United States.